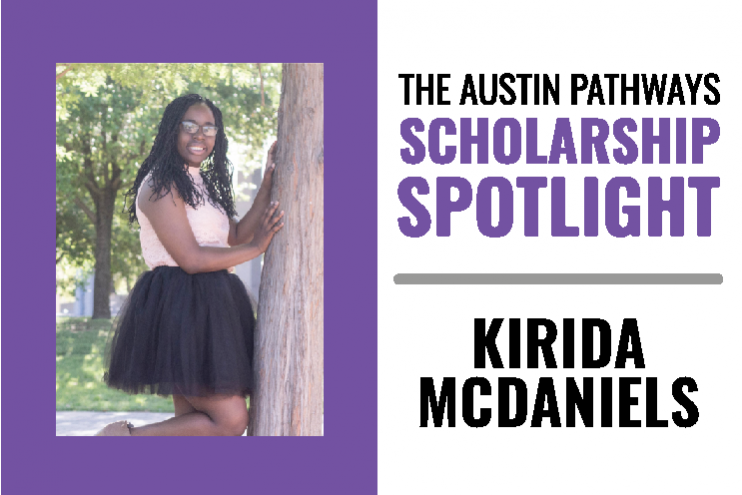 I’m Kirida McDaniels, and I am proud to be a two-time awardee of the Austin Pathways HACA Scholarship. This scholarship is helping me continue my education and is bringing me closer to becoming the first person in my entire family to earn a college degree. I faced a lot of challenging personal experiences throughout primary and secondary school. From an early age, I was a victim of bullying. I was bullied for so long, that I cannot even remember when it all began. Throughout elementary school, most of my classmates targeted me for being different. I did not know how to react to the bullying, so I took it out on myself. It took me a long time to realize that I did not need to feel angry at my bullies. Once I learned how to look at them as a victim of their own emotions, it was a lot easier to ignore them and tune them out. Even though I was being bullied, I maintained above-average grades in high school and participated on the John H. Reagan Early College High School wrestling team. I was the district champion for two consecutive years, went to the state tournament all four years, and during my senior year, I won second in the regional tournament and was ranked no. 13 in the State of Texas. In 2017, I graduated from high school in the top 5 percent of my class with a 3.7 grade point average. I am currently a sophomore at Texas Texas A&M University in College Station studying general engineering. Eventually I would like to major in electrical engineering, but I am working on completing the required coursework. I enjoy my classes and have also become involved with Chi Alpha (student ministry) and the National Society of Black Engineers, but it has not all been easy. After my first few college exams, I was diagnosed with test anxiety. I scored low on my heavily weighted classes; which were precalculus and engineering 270. Both grades were below 65 percent. After I was diagnosed, I sought help from the disability services on campus and received accommodations. The other test went better, and I ended precalculus with a C and engineering with a B. I did not imagine that I could come back from that. My final grades were two B’s and three C’s. This semester I am in less hours, 13 credit hours exactly, and I want to strive for nothing less than an 85 in all my classes. The first semester showed me that was possible. Coming to this point in my life has not been easy, I but I know that I no longer have to go through this experience by myself. Organizations like HACA and Austin Pathways continue to support me along the way and have provided me with the tools I need to overcome adversity.